We continue to be extremely concerned about cuts to funding for Community Legal Centres (CLCs) originally revealed during the 2015 Budget. The Hume Riverina Community Legal Service is uniquely positioned as a cross-border community legal centre, providing free legal services to a vast catchment area of 21 Local Government Areas in North East Victoria and the Southern Riverina of NSW. 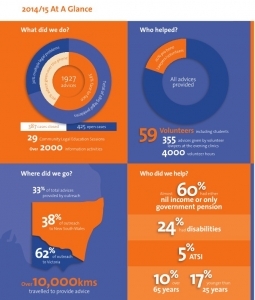 In the 2013/14 year our 4 lawyers gave nearly 1800 advices, provided legal education to over 1300 people and provided intensive casework to more than 200 people. We are the only free legal service within a 2 hour radius in both states. The need is greater than we can currently meet. The Productivity Commission Report released in December 2014 recommended that the Government urgently increase funding for legal assistance services (such as CLCs and Legal Aid) by $200million per year. This underfunding has an even greater impact in regional communities where disadvantaged people simply have no other option. Despite this, cuts of 28.7% to funding for CLCs are now expected next year (2017/18). This means that even more disadvantaged people in need of free legal help in North East Victoria and Southern Riverina NSW may miss out. Community Legal Centres are campaigning under the hashtag #FundEqualJustice to raise awareness of the critically important work CLCs do but also the impact of these impending cuts on the most vulnerable. For our community, these cuts may mean less free legal advice services in places such as Wangaratta, Benalla and Myrtleford in Victoria and Deniliquin, Finley, Henty, Holbrook and Corowa in NSW. We certainly won’t be in a position to expand our service and attempt to meet the growing need of our community. We urge you to make contact with your local federal MP and let them know the impact that this will have. Please be assured of our ongoing desire to provide free legal advice and assistance to the people of our community, particularly to those who are vulnerable and disadvantaged in their access to justice. We are incredibly proud of all we have managed to achieve, particularly in the current climate of impending funding cuts. We are grateful for all our supporters, including our volunteers and pro bono lawyers/firms; without you we would not be able to provide such an extensive and quality service to the people of North-East Victoria and the Riverina of NSW. Our Principal Lawyer is in Melbourne this week at the National Association of Community Legal Centres Annual Conference. She spoke yesterday about “Piecing together the puzzle: the perspective of community organisations about legal need”, a project undertaken by HRCLS in two stages, about legal need in North East Victoria and Southern Riverina NSW. One of our fabulous students, Tessa, was employed as a Projects Officer earlier this year to survey community organisations in our catchment area, analyse the results and compile this report. Community organisations provided a key insight into their perception of legal need, when and where they are likely to refer their clients, and what barriers they face in doing so. This paper aims to use these findings constructively, to suggest prospective solutions that will help to build sustainable community partnerships between legal and non-legal service providers and further, help provide supported pathways for clients to ensure they can access legal services.